What is the spike in forex chart? The sudden large movement on Forex market due to an imbalance of liquidity is called spike. We can see such spike most of the time on major data release such as Non-Farm Payroll (NFP), FOMC statement, ECB Press conference, Rate declaration etc. We can also see such a spike in normal market condition without news. Forex Spike Trading is a popular trading style to some traders I am here going to describe on the financial, technical causes behind the creating spikes on the chart. To build up Spike Trading Strategy you need to know the real cause of Spike. In this view mainly two reasons are behind here: 1) Excessive liquidity 2) Lack of liquidity. 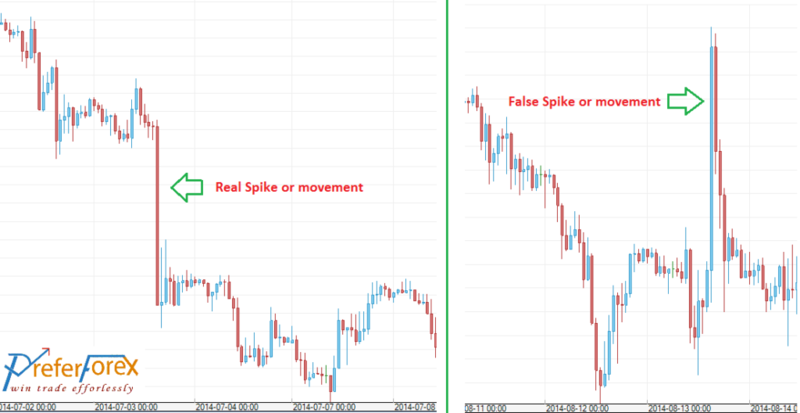 As a trader you already familiar with also 2 types of spike we can see in the market: 1) False spike 2) Real spike. I have stated here those types to make easy to understand the topics. Excessive liquidity: Excessive liquidity leads to a Real spike in the market. When there is excessive a liquidity market spike and make a fresh movement. The market needs not any news or fundamental issue for this movement. Most of you may be surprised by seeing this movement without any news. But the truth is that when there is excessive liquidity market move crazily and this lead a fresh movement. This excessive liquidity play in the market because of Professional money, Big investor or Bank takes their position. This movement can occur at any time with or without any news. Lack of liquidity: Lack of liquidity leads to a False spike in the market. This occurs mostly at the time of the news. During news time or 1/ 2 minutes before the news, market moves crazily in a direction, then returns immediately to the level from where it starts the movement by making a false spike. This is because if there is a lack of liquidity market moves crazily up or down to collect the liquidity. But it can’t sustain and return to the level from where it starts to move. This is because when markets make such false spike to collect liquidity the interbank cannot shift the exchange rate and they still trade with the previous price level, for this reason, market return to the previous price by creating a false spike. PreferForex traded all cautiously all the market situation upon best analysis and market information that us unique forex signals provider.